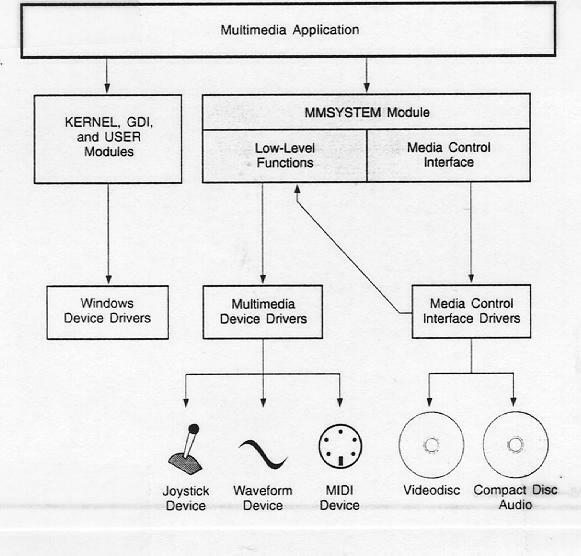 The materials presented here are adapted from MS Multimedia Development Kit, Mutlimedia Authoring Guide, Multimedia Programmer's Guide. 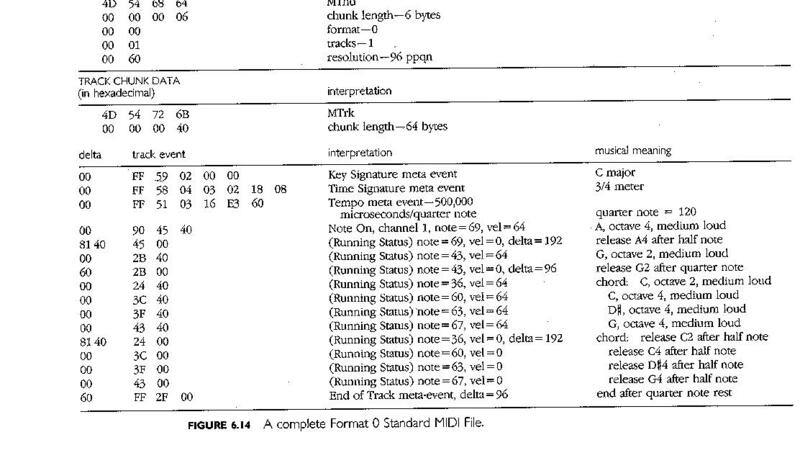 "MIDI: A Comprehensive Introduction", by Joseph Rothstein. A measurement somewhere between MINI and MAXI? A standard protocol for communication between musical instrument and computers? MIDISCAN: converts printed sheet music into multi-track MIDI files. Sequencer: A �box�, a feature built into an instrument (keyboard, synthesizer), or a software program for recording/playing back songs stored as MIDI files (not sound). When a sequencer plays MIDI files, it sends MIDI data(messages) to a MIDI synthesizer. can change the speed (tempo) of the playback. can edit what you have recorded. much smaller file size compared with that of digitizing sound. Note On on Channel 3, play note 96 with velocity (how hard) 127. Status byte has two nibbles, the high nibble represents the message type, the low nibble represents the channel number (0-15). Piano keyboard has 88 notes (21-108 on MIDI note number). Middle C is 60. For Note on message, the second data byte specifies the velocity (1-127). Velocity indicates how hard or how fast you press the instrument. For velocity insensitive instrument, 64 is transmitted. Note on with velocity 0 is equivalent to Note off. Running status - multiple MIDI channel message with the same status byte, the status byte only need to be sent once. 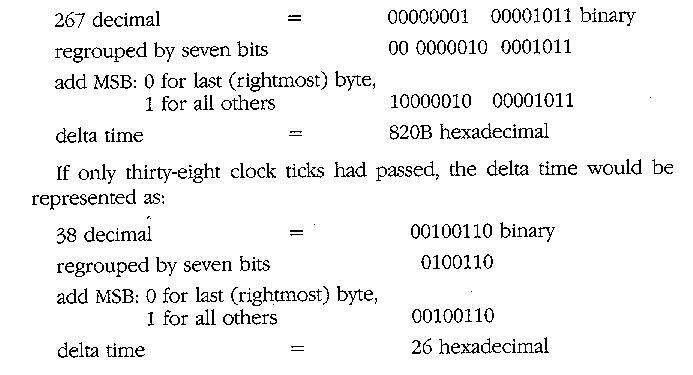 Note that the 7th bit of status byte is set to one, and data byte has 7th bit set to 0. Some keyboards respond to pressure on keys after notes was played. MIDI guitars usually use a variable pedal. MIDI wind instruments usually use breath pressure. 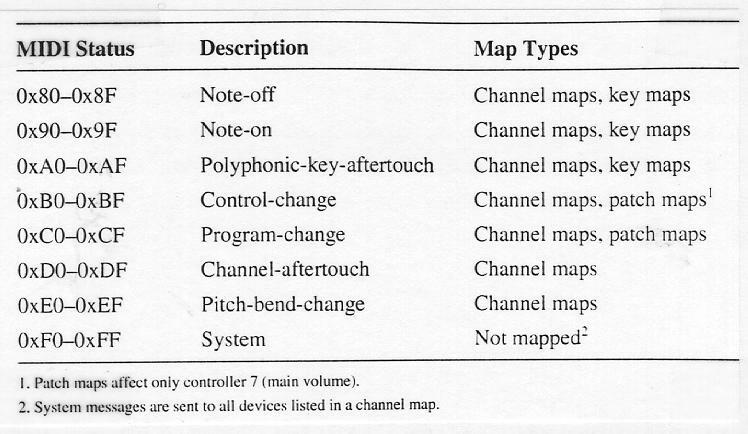 Channel (monophonic)-aftertouch (0xD0-0xDF)- affect all notes playing on that channel. provide control similar to knobs and switches. may take physical form of slider, wheels, variable pedal, breath controller. Number 7 is Volume. Use value of 80 (0x50) for main volume controller for normal listening. 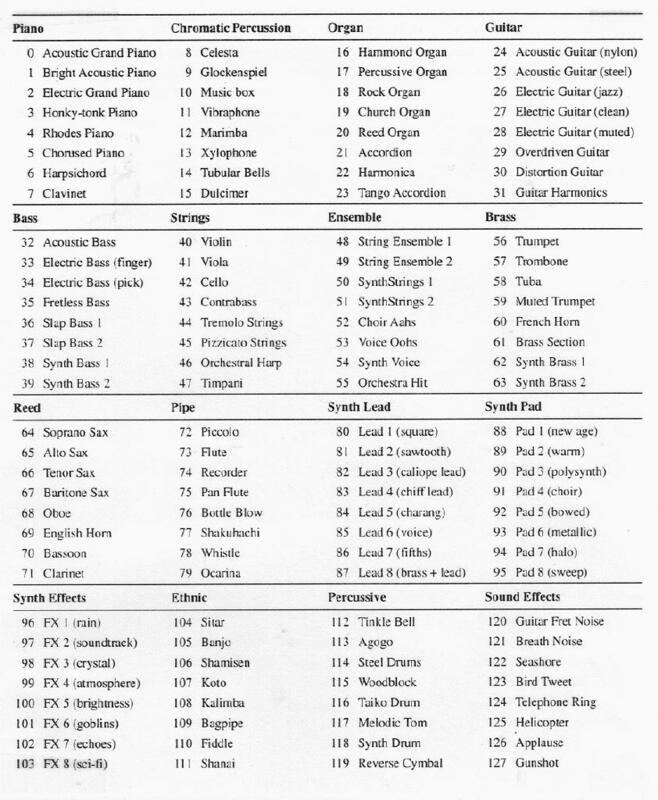 Number 64 is Sustain Pedal. Most MIDI instrument offer more than one sound for you to play. Such sounds are often called programs or patches. Selecting a program on a MIDI instrument will cause the instrument to transmit a Program Change message. This allows the slave units to change programs accordingly. It is the number of the program that is transmitted not the sound. Some instruments allow you to map the one program number to other. See the Standard MIDI Patch Assignments next page. They are based on the MIDI Manufactures Association (MMA) General MIDI Mode specification. Bend the pitch up or down from whatever the �normal� pitch is. On keyboards, a special wheel, lever, or joy stick near the left end is used for pitch bend. Pitch bend, continuous controllers, and pressure are called continuous messages. They are often transmitted in long streams to reflect the changing position of physical controller involved. 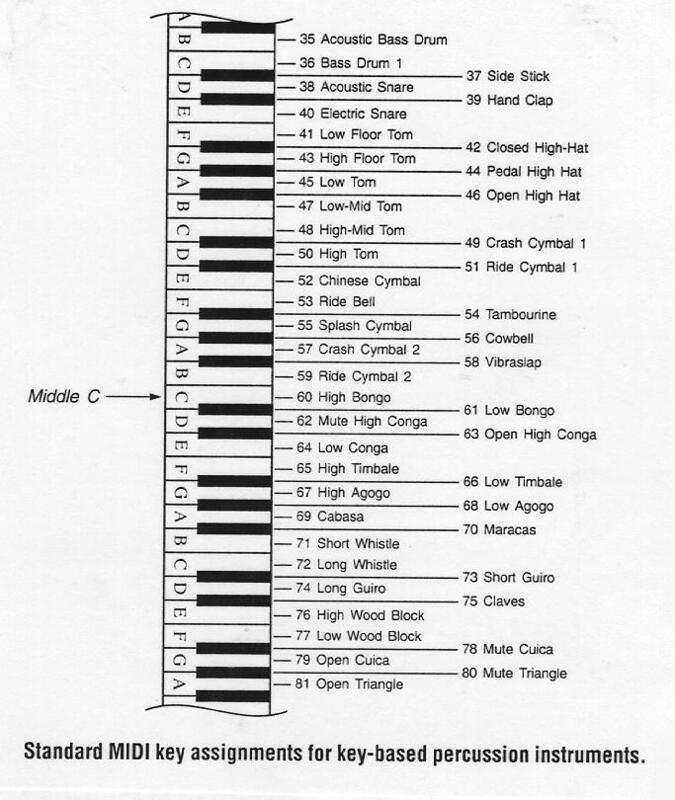 There are MIDI modes related to how an instrument responds to channel messages. Omni on - listen to all channels. Omni off - listen to specific channels. Poly on - play more than one note at a time. Mono on - play only one note at a time. Mode 1: Omni On, Poly. Mode 3: Omni Off, Poly. System real-time messages: for synchronizing devices, sequencer, drums. 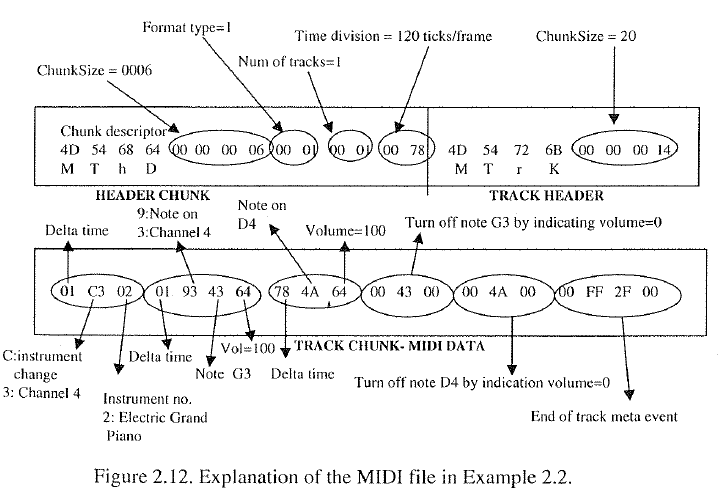 MIDI Timing Clock message - transmitted 24 times every quarter note. Active Sensing message - �I am still here� message. There are all one-byte message (time is critical). Can be in the middle of another message, in the MIDI data stream. System common messages: covers miscellaneous functions. Song Position Pointer message (followed by Continue message to synchronize the playback). MIDI Time Code message - give absolute time to synchronize with external world (film, video). System exclusive messages: for certain brand or model of instrument (as an extension to standard MIDI message). A part of Window Multimedia Extension system software. 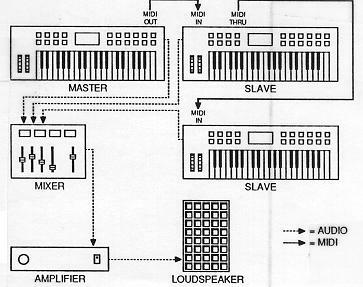 It uses a MIDI setup map to translate or redirect MIDI messages. 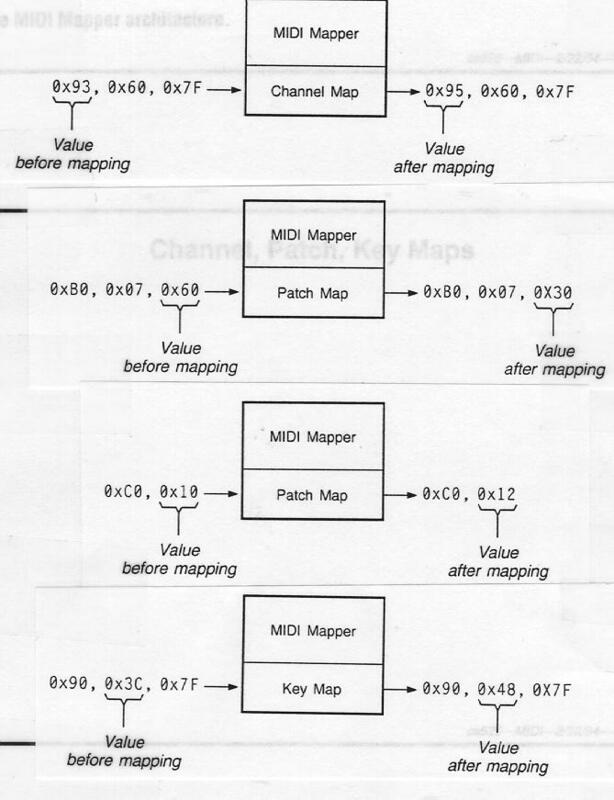 MIDI 1.0 Detailed Specification does not define any standard patch assignment for synthesizer. 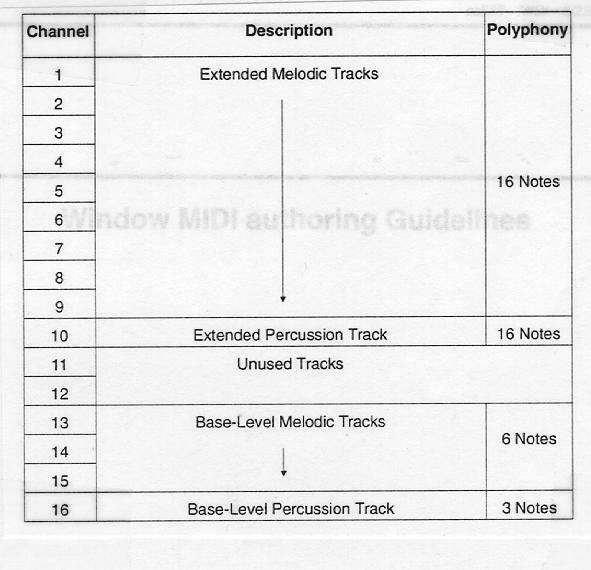 Windows provides MIDI authoring guideline to facilitate the representing music in multimedia computing. Use MARKMIDI src-filename dest-filename to mark a MIDI file which conforms to the guideline. Author for both base-level and extended synthesizer setups. Use MIDI channels 13 through 16 for base-level synthesizer data (reserve channel 16 for key-based percussion instruments). Use MIDI channels 1 through 10 for extended synthesizer data (reserve channel 1O for key-based percussion instruments). Prioritize MIDI data by putting crucial data in the lower-numbered channels. Limit the polyphony of non-percussive channels to a total of 6 notes for base-level data and 16 notes for extended data. Limit the polyphony of percussive channels to a total of 3 notes for base-level data and 16 notes for extended data. 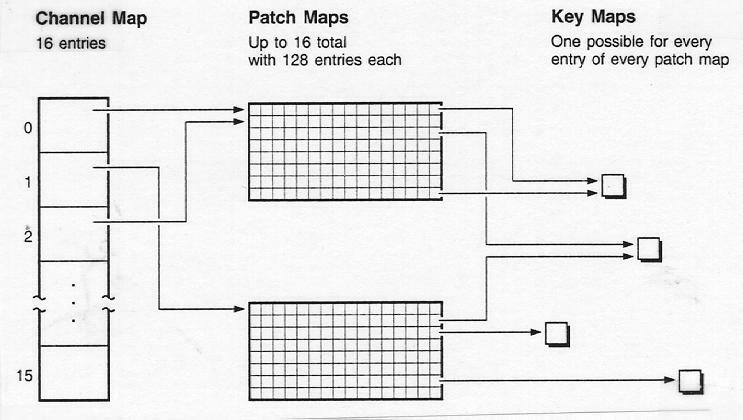 Use the standard MIDI patch assignments and key assignments. Always send a program-change message to a channel to select a patch before sending other messages to that channel. For the two percussion channels (10 and 16), select program number 0. Always follow a MIDI program-changc message with a MIDI main-volume-controller message (controller number 7) to set the relative volume of the patch. 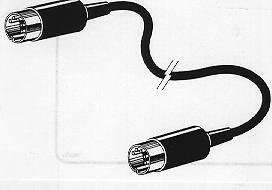 Use a value of 80 (0x50) for the main volume controller for normal listening levels. For quieter or louder levels, you can use lower or higher values. Use only the following MIDI messages: note-on with velocity, note-off, program change, pitch bend, main volume (controller 7), and damper pedal (controller 64). 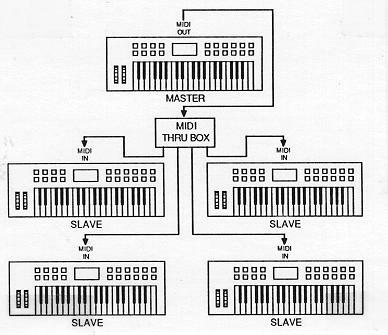 Internal synthesizers are required to respond to these messages and most MIDI Musical lnstruments will respond to them as well. Use the MARKMIDI utility to mark MIDI files authored for Windows. SMF consists of groups of data called chunks. Header data include the file format, # of tracks, and divison. Format 0: single multichannel track. The first track consists of the tempo map to be used for all subsequent tracks. Most sequencer use format 1 for their implementation of SMF. Format 2: any number of independent tracks, each with its own unique meters and tempos. Not common. The division value is interpreted according to the most significant bit. Bit value =0: the rest 15 bits are resolution in ticks per quarter note. The elapsed time since the preceding track event. Variable length (Max=4). Most Significant bit used as signal. MSb=1 indicates more bytes follow. MSb=0 indicates this is the last byte. Describe the track names, lyric, key signature, instrument names. After delta time, start with 0xFF, followed by meta event type, length of the data, data itself. Here is the matlab code for generating a midi file given the midi binary content in hexadecimal. 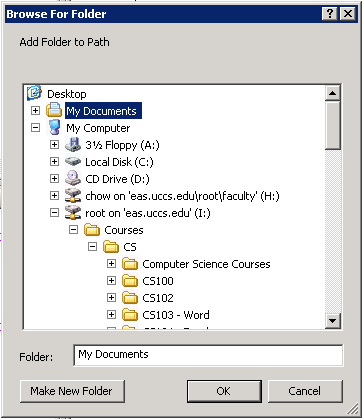 The file content is similar to the one in Figure 2.12 above, Only longer. Is this four note sequence familiar? Who is the author? Once select the sound folder with hex2dbytes, click Save button and the Close. 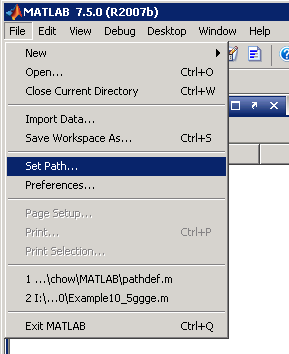 We can then test if matlab can find it by typing "which hex2dbytes" command in the command window. If it finds it, it will echo the path as follows. 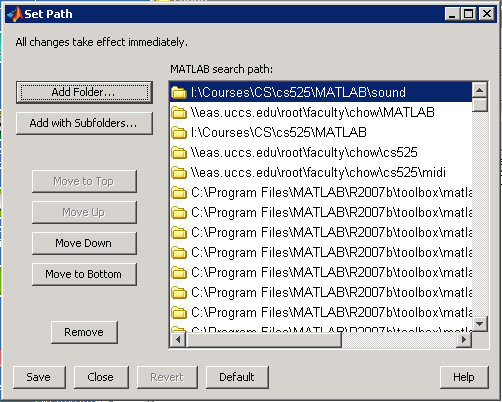 Now we can run our matlab code to generate the mid file. LOC 0: 4d 54 68 64 00 00 00 06 00 01 00 10 00 c0 4d 54 "MThd..........MT??" LOC 16: 72 6b 00 00 00 7c 00 ff 7f 03 00 00 41 00 ff 58 "rk...|......A..X??" LOC 32: 04 04 02 18 08 00 ff 51 03 0a 49 6d 00 ff 59 02 ".......Q..Im..Y.??" LOC 48: 00 00 00 ff 01 2a 43 6f 70 79 72 69 67 68 74 20 ".....*Copyright ??" LOC 64: 28 43 29 20 31 39 39 30 20 62 79 20 56 6f 79 65 "(C) 1990 by Voye??" LOC 80: 74 72 61 20 54 65 63 68 6e 6f 6c 6f 67 69 65 73 "tra Technologies??" LOC 96: 00 ff 01 2a 43 6f 70 79 72 69 67 68 74 20 28 43 "...*Copyright (C??" LOC 112: 29 20 31 39 39 31 20 62 79 20 56 6f 79 65 74 72 ") 1991 by Voyetr??" LOC 128: 61 20 54 65 63 68 6e 6f 6c 6f 67 69 65 73 00 ff "a Technologies..??" LOC 144: 2f 00 4d 54 72 6b 00 00 09 61 00 ff 21 01 01 00 "/.MTrk...a..!...??" LOC 160: ff 03 14 50 69 61 6e 6f 20 54 72 65 62 6c 65 20 "...Piano Treble ??" LOC 176: 20 20 20 20 20 20 20 00 c1 02 00 b1 07 61 00 b1 " ......a..??" LOC 192: 0a 7f 00 91 37 7f 60 39 7f 60 3c 7f 5e 41 7f 81 "....7.`9.`<.^A..??" LOC 208: 40 43 7f 10 81 41 40 81 30 91 41 7f 06 81 3c 40 "@C...A@.0.A...<@??" LOC 224: 0c 37 40 4e 91 37 7f 2e 81 39 40 32 91 39 7f 60 ".7@N.7...9@2.9.`??" LOC 240: 3c 7f 0c 81 41 40 04 43 40 50 91 43 7f 60 41 7f "<...A@.C@P.C.`A.??" 4d 54 68 64 4-character chunk ID: "MThd"
4d 54 72 6b 4-character chunk ID: "MTrk"
00 ff 58 04 04 02 18 08 Time signature meta event, 4/4 meter? 00 ff 01 2a 43 6f ... Copyright meta event? 00 ff 21 01 01 meta event? LOC 0: 4d 54 68 64 00 00 00 06 00 01 00 0f 00 c0 4d 54 "MThd..........MT??" LOC 16: 72 6b 00 00 00 aa 00 ff 7f 03 00 00 41 00 ff 58 "rk..........A..X??" LOC 32: 04 04 02 18 08 00 ff 51 03 08 2c a2 00 ff 59 02 ".......Q..,...Y.??" LOC 144: 01 2a 43 6f 70 79 72 69 67 68 74 20 28 43 29 20 ". *Copyright (C) ??" LOC 160: 31 39 39 31 20 62 79 20 56 6f 79 65 74 72 61 20 "1991 by Voyetra ??" LOC 176: 54 65 63 68 6e 6f 6c 6f 67 69 65 73 00 ff 2f 00 "Technologies../.??" LOC 192: 4d 54 72 6b 00 00 06 be 00 ff 21 01 01 00 ff 03 "MTrk......!.....??" LOC 208: 14 42 61 73 73 20 44 72 75 6d 20 20 20 20 20 20 ".Bass Drum ??" LOC 224: 20 20 20 20 20 00 c9 01 00 b9 07 75 00 b9 0a 7f " ......u....??" LOC 240: 87 00 99 24 59 30 89 24 40 82 10 99 24 5b 30 89 "...$Y0.$@...$[0.??" LOC 256: 24 40 50 99 24 59 30 89 24 40 84 10 99 24 48 30 "$@P.$Y0.$@...$H0??" LOC 272: 89 24 40 82 50 99 24 33 30 89 24 40 82 50 99 24 ".$@.P.$30.$@.P.$??" There are quite a lot of midi editors out there. You can download Able MIDI editor from widisoft.com. We can specify the midi file properities by select the "operations | edit midi file properties..." menu. Enter the copyright info, change the meter and tempo. 1. 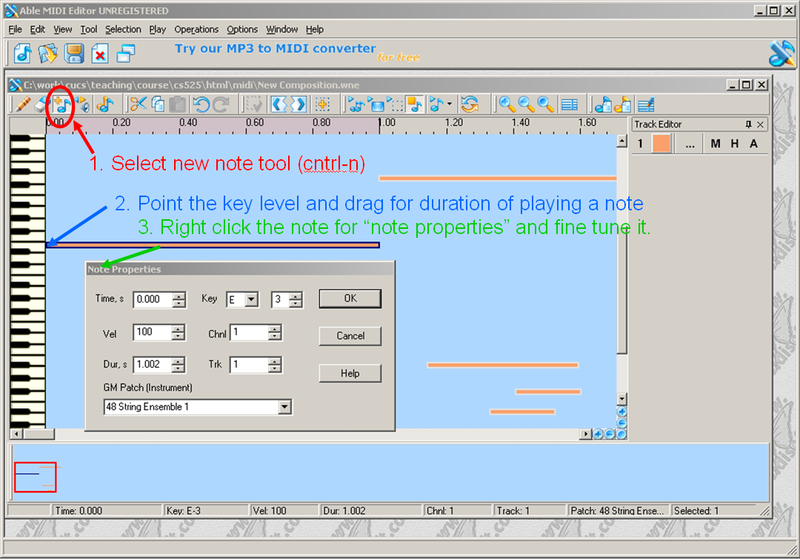 Select the new note tool icon on the tool bar, or hit control-n (note) to start specifying the notes. Then drag the note symbol to the right for a rough estimate duration of playing (the bar length corresponding the playing duration). 3. Right click the note bar symbol to bring up note properties dialog window and fine tuen the specification of the note. For the above simple midi file, we run the command " ~cs520/bin/bigend simple.mid > simple.mid.txt"
LOC 0: 4d 54 68 64 00 00 00 06 00 01 00 02 00 78 4d 54 "MThd.........xMT"
LOC 16: 72 6b 00 00 00 30 00 ff 02 13 43 68 6f 77 54 68 "rk...0....ChowTh"
LOC 32: 65 43 6f 6d 70 6f 73 65 72 32 30 30 36 00 ff 58 "eComposer2006..X"
LOC 48: 04 04 02 18 08 00 ff 59 02 00 00 00 ff 51 03 07 ".......Y.....Q.."
LOC 64: a1 20 00 ff 2f 00 4d 54 72 6b 00 00 00 36 00 c0 ". ../.MTrk...6.."
LOC 80: 30 00 90 40 64 81 6f c0 37 00 90 4a 64 01 80 40 "0..@d.o.7..Jd..@"
LOC 96: 00 21 c0 00 00 90 2e 64 2d 90 27 64 13 90 2a 64 ".!.....d-.'d.. *d"
LOC 112: 1d 80 27 00 11 80 2e 00 02 80 2a 00 3a 80 4a 00 "..'.......*.:.J." LOC 128: 00 ff 2f 00 "../." ff 51 03 07 a1 20: tempo 120 Quarters per minute. Create a 10 second midi file using tool such as ablemidi. 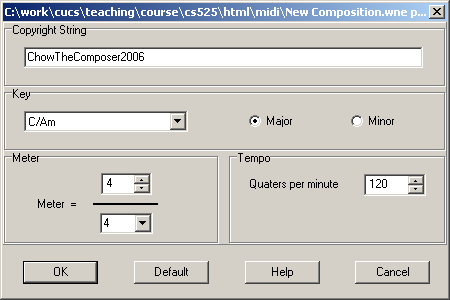 Save the midi file as <login>TheComposer.mid in your cs525 web page directory. Let us vote next wednesday on whose midi is the best. The winner gets some bonus point? Here are some simple mid files created using Able MIDI editor. * otherwise, it returns an MCI error code. /* Open the device by specifying the device name and device element. 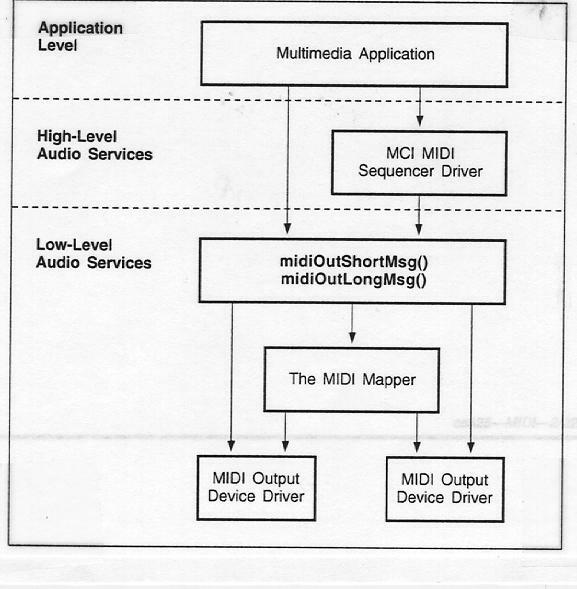 * MCI will attempt to choose the MIDI Mapper as the output port. /* User does not want to continue. Not an error, * just close the device and return. * complete. At this time, the window procedure closes the device.